For the first time ever in Australia, Andreas Ehn, the first employee and CTO of Spotify will speak of his personal journey and the growth path of one of tech’s biggest juggernauts. As part of the event, Jane Polak Scowcroft, Head of Product at CSIRO’s Data61, will engage Andreas in a fireside chat to discuss what it takes to build successful startups, how to scale globally from smaller markets, and touch on his role as Venture Partner at Antler, a global startup generator and VC company. 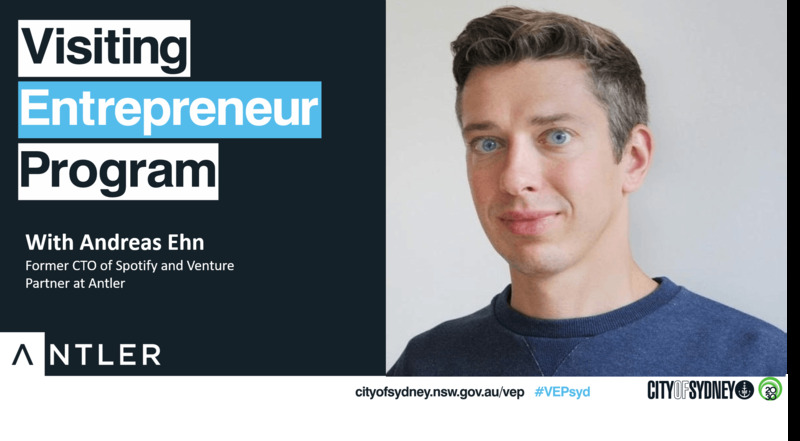 This event is part of the Visiting Entrepreneur Program, produced by the City of Sydney in collaboration with Antler, Fishburners, and TechSydney. Ticket price includes light refreshments. Andreas Ehn is a board member and angel investor in several companies. He is frequently hired as an advisor by promising startups, venture capital funds and corporates. Previously he was Spotify’s first employee and chief technology officer (CTO), where he brought together the world-class tech team that designed and built the platform and product for the music service. He is also co-founder of Wrapp and was its CTO until 2014. He now is a global Venture Partner with Antler. Jane Polak Scowcroft is the Head of Product at CSIRO’s Data61, Australia’s foremost data science research institute. With Computer Engineering undergraduate and Psychology-based Masters, Jane brings international experience from Canada and Silicon Valley to her role, recognising the power when deep research, science and tech is brought to market. Jane works side by side with world leader researchers to translate their discoveries to breakthrough innovations, and is passionate about the opportunity for Australia to be world leading. Founded in Singapore in 2017, Antler is a global startup generator and early-stage VC that is building the next big wave of tech. With the mission to turn exceptional individuals into great founders, Antler aims to create thousands of companies globally. They select the world’s most brilliant and determined people, help them find the right co-founder and connect them to a top tier network of advisors and experts worldwide. Antler breaks the barriers to entrepreneurship by providing funding from day one and building strong teams from the ground up, while enabling founders to rapidly launch and scale their ideas. Fishburners is a not-for-profit dedicated to creating highly scalable Australian tech startups, through inspiration, collection and connection to support. Started in 2011, we’re proud to have become Australia’s largest community of highly scalable techstartups, Australia’s largest host of startup-focused events, Australia’s largest funnel for new startups, and the largest non-profit in Australia dedicated to supporting startups.